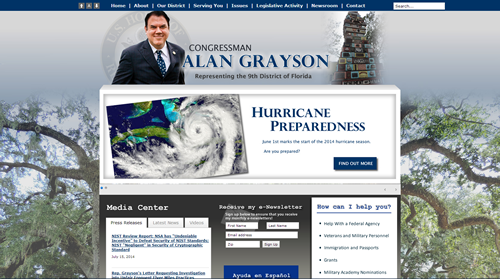 DCS is excited to announce the launch of Congressman Alan Grayson's new website. DCS worked to design and build a user-friendly site that best reflects the Congressman and the 9th District of Florida. The site highlights a banner, which rotates to showcase the district’s landmarks, as well as a new media center featuring the Congressman’s latest news, press releases, and videos. DCS is excited to announce the launch of Congressman Sam Farr’s website. As a new website client, DCS worked to build a user-friendly site from the ground up, including an innovative homepage footer with office locations.